THE IMPORTANCE of festivals in the ancient world may best be illustrated in the New Year’s Festival in Ancient Sumer. This is known as the AKITU Festival (A.KI.TU. = On Earth Build Life), and was celebrated in Babylon (click below image) and other cities, the most important being ANU’s cult centre, URUK (the biblical Erech), on the 1st - 10th of the month of Nisan. In the Age of Aries this corresponds with the first decan of Aries. The original for this festival was the famous state visit to Sumer paid by ANU and his Queen-Consort ANTU. This occurred circa 3800 BCE. A. Kalpa 3, Manvantara 7, Mahayuga 28, Yuga 1, Sar 2, Ner 6, Sossu 10. We cannot state with any certainty which year it would have been. Sar 3, Ner 1, Sossu 1 is when we place the establishment of the Nippur Calendar (i.e., 3773 BCE). 1. The New Year Rituals, which evolved from the Sumerian AKITU Festival, whose roots can be traced to this event. 2. The Calendar, or the measurement of Time, was granted to humankind. This led to celestial observations, and to the creation of a long-running tradition of Astronomer-priests. In the Kalachakra Tantra, we found that its origin was as a secret sermon preached by the Buddha at the time of his famous Vulture Peak Sermon. This sermon was requested by King Suchandra of Shambhala. Some people, generally the more reactionary of the anti-occultists, find nothing but evil in the name Shambhala. We do not recognize this to be the case. In fact, what we have found is that Shambhala, like Nietzsche and his ideas, and just about any other powerful concept or person from the past, has been co-opted by the fascistic elements in the social-control department. The New Age is nothing of the sort. In fact for the most part it is the same damnable thing repackaged, like a warmed-over TV dinner. Bear this in mind when reading the theories we are postulating. 1. We have identified Shambhala with the Celestial Palace atop Mount Meru. Mount Meru is to be found in southwestern Tibet. It is called Mount Kailasa, where thousands of pilgrims go every year. It is Shiva’s mountain. Every year, the Bön-pas and the Nyingmapas celebrate a New Year’s Day festival which is similar to the Akitu Festival. They erect the phallic pole in the valley below the mountain. This is symbolic of the antenna-like beacon the DurAnKi is supposed to be. Interestingly enough, not far from this location we have cave cities which resemble the cave communities in the Dead Sea region, and those in New Mexico. Mount Meru is Mount Su-Meru. The earthly Meru is where the focus point, the communication beacon, as it were, is. And Meru, in the human body, is the Sushumna Nadi. 2. We could go a step further and suggest that the Kings of Shambhala are successors to and/or holders of the Anu-ship, Lord of Nibiru. There is nothing far-fetched in any of this. It would seem that sometime circa 973 BCE, a new Dynasty of Kings was initiated, beginning with Suchandra. Perhaps it is due to some natural cycle that is peculiar to the 12th Planet. At 173 BCE, the Maccabees started their short-lived rule, and this facilitated the creation of the Chasidim, which had its origins in the Chaldean Priesthood, (as Chasdim is seen to be another term for Chaldean), which led to the Messianic Movement and to the Essenes and Pharisees. These in their turn led to Rabbinic Judaism and Gnosticism, as well as the religion called Christianity by billions today. But, the major events in the West took place much later than 173 BCE. Also, this same year, Antiochus Epiphanes seized control of Coele-Syria and Judea. Two years earlier he seized the throne of the Seleucid empire. It is this Emperor who had Nemrud-Deg built in his honor. Perhaps a meeting took place there, between Antiochus, and the Nefilim? Maybe. But in India and Central Asia, greater things were taking place. While the dates given in the history of the Kalachakra Tradition are hard to fix with much certainty, it is clear that in the year 173 BCE the first KULIKA Initiated so many people into the Kalachakra Tantra that he was the first to receive the name KULIKA. In turn, he was the 8th King of Shambhala, each king ruling 100 years, this means that the first king began his rule 873 BCE. And, too, it was at this time, roughly, that the Gnostic Traditions in the West were just beginning to develop, via the various philosophical schools and Mystery Rites. This is the closest to a confirmation we can get from any source. The Kalachakra Tradition is not your average bargain basement tradition! Its main thrust is in the Initiation of advanced Buddhist monks into the Sand Mandala of Kalachakra. Once the candidate has been led through the seven gates, and received the seven initiations, it is possible for them to be received in the court of Shambhala. Shambhala, says the Dalai Lama is not a place we could get to very easily, with our poor excuse of technology. It is very far away, in space. Much like the 12th Planet is very far away, in space. The description in the Kalachakra Tantra, of Shambhala is much like the descriptions given by remote viewers of the Galactic Administration Centers they saw in their visions, and the same thing can be said about Aleister Crowley’s journeys, recorded in The Vision and the Voice, and The Heart of the Master, and perhaps, too, to some extent, in The Amalantrah Working. 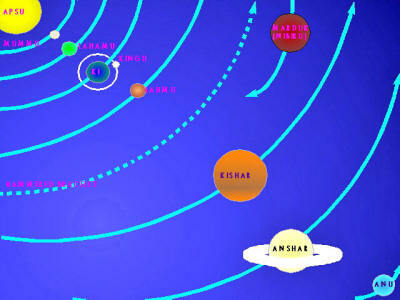 Nibiru, then, when it approached, appeared in the North. This is very crucial, since Meru, or Su-Meru, is situated in the North, with a Northerly Orientation. Shambhala, too, is to the North of Tibet, and the Kingdom of Light, of the Mandaeans, is in the North, where the sources of the Celestial Jordan are located. 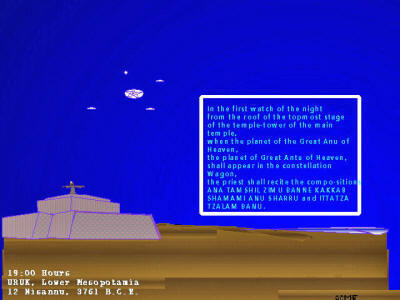 The Mandaeans orient their temples to the North, with a window which allows them to see the Pole Star. In the ceremony known as the "Calling," and the important one, known as the "Walking," in which the Magician is initiated gradually through the Seven Gates, the Gate is to be placed in the North of the Magician’s Temple. The gateway that is in the North, then, would appear to be the four stars in the Great Bear (originally called the Constellation of the Wagon). As Earth, and the other planets rotate around the Sun, it appears that the Sun rotates clockwise, yet the Earth goes counterclockwise around the Sun, as do the other planets. Then it would appear that this planet comes toward the Earth from the North, whereas the other planets are visible east to west, along the southern part of the sky. The rituals associated with the AKITU festival are said to have their origins in the State visit of ANU and ANTU. ANU and ANTU bestowed the Calendar upon humankind, as the Kalachakra Tantra was similarly bestowed, with the endorsement of the Kings of Shambhala. Such correlations between ritual and astronomical occurrences can be seen today in the practices of the Dogon Tribe in Mali, who, every 50 years or so, reenact the activities associated with the Stars and/or Planets in the Sirius system. "As Above, So Below" is not just a platitude. There are real events, real celestial bodies, real persons involved. Imagine then, enacting on Earth, in Earth-Time, ritual events taking place in the heavens in Space-Time, simultaneously, and in times past. This is religion par excellence. This is not simply the reenactment of the story of a god dying and being reborn so the crops will grow. This deals with events in our solar system, not merely aspects of our subconscious or our psyche. The Enuma Elish is a story which should be read and interpreted by all who are interested in these subjects, and understood in the light of The Code of the Eternal. There are many stories of origins in the Sumerian ’myths’ which give credence to an Extraterrestrial Origin of humankind, and to the speculations of Science. Cold, hard, physical fact-based Science. Science! In fact, it is a definite ’given’ that the first part of Genesis, in the Hebrew Bible, from the Creation to the Deluge, was taken from Babylonian and Sumerian originals, both as inherited traditions, and as material received from the priests of Babylon, during the Captivity, for we know that the Old Testament was not written before the Captivity. The Akitu festival was celebrated once a year at the beginning of Spring. In those days humankind was a part of the natural process, and the ritual acts performed by humans counted for something. One thing, such acts kept humankind from going over the brink, into chaos, which was to be avoided at all costs, that was the law. 2. 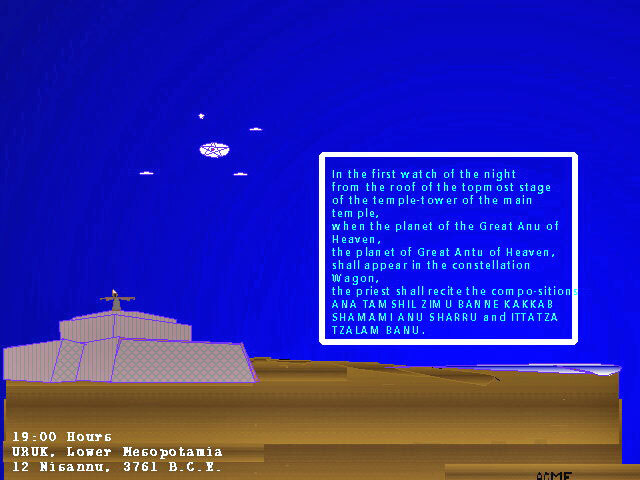 A more recent cosmogony developed by the theologians of Nippur in which the creation of the world was credited to Enlil following his victory over Nippur: the creation of the world was attributed to Enlil after his victory over Tiamat and the forces of Chaos. This has parallels in the Enki-ite traditions, because it was first credited to EnKi, (or EA), who was the original hero to fight Tiamat. (His name in this case would be Nudimmud). 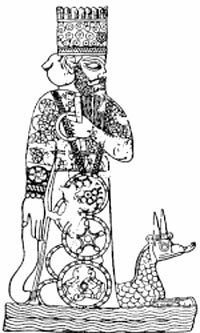 Later, the credit would go to his son, MarDuk. Following the Creation of humankind, the regular determination of humanity’s fate was necessary, so the theologians reasoned, therefore the annual oracle and New Year festival.